The bad news is that when it comes to flaws, The Mothman Prophecies seems to have lifted one too many from In Dreams. In Dreams arrived late in the 1990s, just when that decade's teen horror craze was emitting its dying breath (although we know that it's bound to get back up and chase us again as if it had never been stabbed). 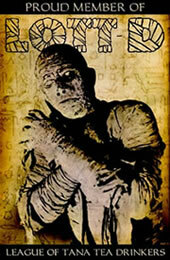 It was promoted as a return to `classic horror', although `classic versus teen horror' is more apocryphal than most horror fans admit, but instead it gave us interesting ideas wrapped in a drama package unpleasantly dipped in molasses and with a clichéd ending that you could see coming from the next state. The Mothman Prophecies, based on a series of true events that occurred in Point Pleasant, West Virginia in the late 1960s, is a much better film than In Dreams. However, it is at least sticky with a molasses residue in a couple spots and it also suffers from an ending that is clearly telegraphed about an hour before it arrives. The difference is that here, director Mark Pellington (who also helmed Arlington Road, an underrated gem) is able to capitalize on the atmosphere and create a deep mystery and sense of foreboding that's a match for all but the best "X-Files" episodes. Richard Gere plays John Klein, a Washington Post reporter who specializes in politics. After a traumatic experience that introduces us to `The Mothman' in a veiled way, Klein finds himself inexplicably in West Virginia one night-inexplicable because he had been driving from D.C. to Richmond, Virginia, but instead ended up in Point Pleasant-a seven hour drive in the wrong direction-in an hour and a half. Things get more bizarre, and Klein learns that a number of Point Pleasant residents have been experiencing odd, apparently paranormal phenomena for some time. Most eerily, the phenomena seem related to Klein's traumatic experience. He quickly decides to stay in Point Pleasant and investigate, even though it's obvious that reporting such a story will seem insane to his bosses at the Post, and the topic is not only foreign to Klein, but the Post as well. The Mothman Prophecies is primarily about the paranormal experiences in West Virginia, partially shown and partially told through Klein's investigation. Klein becomes increasingly obsessed with the story, especially since it has the potential for personal catharsis, and The Mothman Prophecies, unlike the book by the same name, almost flirts with becoming a `the protagonist is really just insane' thriller. There have been some comparisons of The Mothman Prophecies with The Blair Witch Project. I suppose that's inevitable, coming out within a couple years of each other and both being presented as true stories (although of course there's at least a kernel of a true story here, whereas The Blair Witch Project was completely fictitious). The Mothman Prophecies blows The Blair Witch Project out of the water, though. Pellington is an extremely skilled director, aside from the minor pacing missteps, and The Mothman Prophecies is marinated in effectively arty extended techniques-alternate film speeds, dissolves, etc. Unlike some other works that imbibe in such technical mastery, the style never threatens to overcome the substance here. Instead, the style and substance merge, and The Mothman Prophecies is often truly scary. Part of the credit for this goes to screenwriter Richard Hatem, who made the smart move to excise all but the slightest hint of UFOlogy that was present in the book, instead focusing on one of horror's classic, and most underused, archetypes. Another large part of the credit lies in a skillful, intelligent handling of a deep, deterministic fatalism. Hatem and Pellington never make this fatalism too blatant, but the existential horror of it is strong enough to even affect the guy in the seat behind you who won't stop squirming and whose cell phone rings every 20 minutes. The Mothman Prophecies also benefits from a haunting score by `tomandandy' (Tom Hajdu and Andy Milburn-who have also done Killing Zoe, Arlington Road and others together) that's almost reminiscent of Brian Eno at times, and pleasantly understated performances by Gere, Laura Linney and Will Patton (although my wife found Gere too understated and liked the film much less than I). 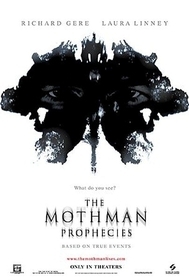 Although the flaws -- including a couple inexcusable hallucinations inserted only to try to get a `jump' out of the audience and the near-miss with an obligatory but enjoyable love story, in addition to the flaws I pointed out earlier -- are serious enough that I can't give The Mothman Prophecies the outstanding praise that so much of it deserves. Don't miss this one if you're a fan of more psychological horror, thrillers, anything remotely like "The X-Files," or anything about the paranormal. Loosely based on real events that occured between in Point Pleasant, WV from 1966 to 1967.